"Massachusetts Births, 1841-1915", database with images, FamilySearch (https://familysearch.org/ark:/61903/1:1:FXXR-NYK : 1 March 2016), Pierce, 1898. Atlantic Pierce was born perhaps about 1815. Some Death Notices from the Cedar Springs Democrat, Cedar Springs, Kent County, Michigan, , at http://kent.migenweb.net/towns/cedarsprings/deaths.html . Ancestry.com. Massachusetts, Mason Membership Cards, 1733-1990 [database on-line]. Provo, UT, USA: Ancestry.com Operations, Inc., 2013. 1880 United States. Census Office. 10th census, 1880 federal population census, Washington, District of Columbia: National Archives and Records Service, ([19--]) , FHL Film 1254543; National Archives Film T9-0543; Page 23B. "United States Census, 1910," database with images, FamilySearch (https://familysearch.org/pal:/MM9.3.1/TH-1942-23039-16600-15?cc=1727033 : 11 November 2015), Massachusetts > Middlesex > Cambridge Ward 9 > ED 777 > image 16 of 36; citing NARA microfilm publication T624 (Washington, D.C.: National Archives and Records Administration, n.d.). 1910 United States. Bureau of the Census. 13th census, 1910 population census schedules, Washington, District of Columbia: Bureau of Census Micro-Film Lab, ([19--?]) , NEW HAMPSHIRE > HILLSBOROUGH > EAST WEARE; WEARE, Series: T625 Roll: 1012 Page: 15. George Plummer Hadley, History of Goffstown, New Hampshire. 1733-1920, Town of Goffstown, (1924) , p. 36. 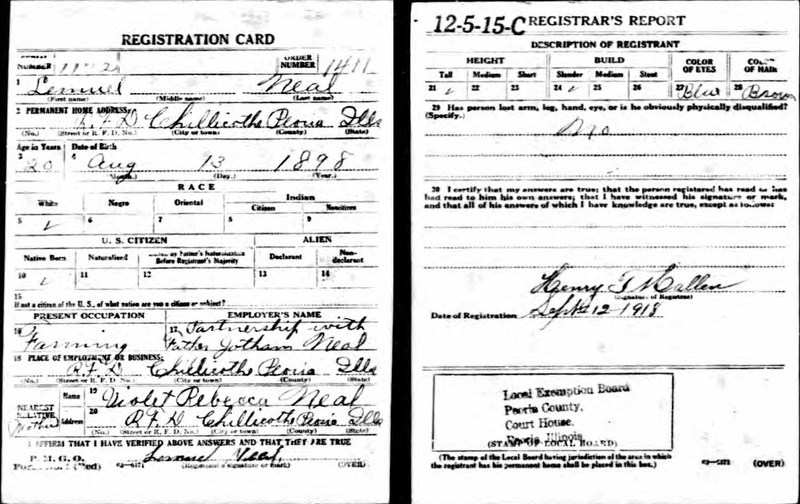 "Massachusetts Births, 1841-1915", database with images, FamilySearch (https://familysearch.org/ark:/61903/1:1:FXHX-XLH : 1 March 2016), Eunice F. Pierce, 1901. Harry Pierce was born perhaps about 1874.
living at Delaware Center, Delaware County, Iowa. 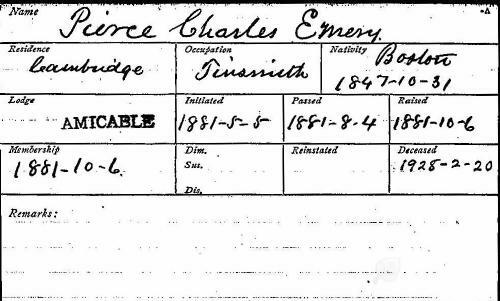 "Vermont Vital Records, 1760-1954," database with images, FamilySearch (https://familysearch.org/ark:/61903/1:1:XF76-YB5 : 6 December 2014), Henry H. Pierce and Sarah P. Ruggles, 26 Jul 1873, Marriage; State Capitol Building, Montpelier; FHL microfilm 540,132. 1880 United States. Census Office. 10th census, 1880 federal population census, Washington, District of Columbia: National Archives and Records Service, ([19--]) , FHL Film 1254336; National Archives Film T9-0336; Page 502C. "Massachusetts Marriages, 1841-1915," database with images, FamilySearch (https://familysearch.org/ark:/61903/1:1:N4NC-XYJ : 17 February 2016), James W Pierce and Alice G Howe, 1 Feb; citing , , Massachusetts, United States, State Archives, Boston; FHL microfilm 1,843,703. "Massachusetts Births, 1841-1915", database with images, FamilySearch (https://familysearch.org/ark:/61903/1:1:FXFL-FYW : 1 March 2016), James W. Pierce, 1904. "Massachusetts Deaths, 1841-1915," database with images, FamilySearch (https://familysearch.org/ark:/61903/1:1:NWT1-BF6 : 10 December 2014), James Wilson Pierce, 23 Jan 1906; citing Cambridge,,Massachusetts, 516, State Archives, Boston; FHL microfilm 2,224,944. "Vermont Vital Records, 1760-2008," database with images, FamilySearch (https://familysearch.org/ark:/61903/1:1:KF1N-TXN : 6 December 2014), Mary Pierce, Death, 25 Nov 1962, Rutland, Rutland, Vermont, United States; from "Vermont, Birth Records, 1909-2008," "Vermont, Death Records, 1909-2008," "Vermont, Marriage Records, 1909-2008," and "Vermont, Vital Records, 1720-1908." Ancestry (http://www.ancestry.com : 2010); citing Vital Records Office, Vermont Department of Health, Burlington and New England Historic Genealogical Society, Boston. "Michigan Marriages, 1868-1925," database with images, FamilySearch (https://familysearch.org/ark:/61903/1:1:NQ7J-JXX : accessed 7 April 2016), Octavius Pierce and Nelly A. Colby, 13 Jul 1870; citing Marshall, Calhoun, Michigan, v 1 p 143 rn 927, Department of Vital Records, Lansing; FHL microfilm 2,342,451. Find A Grave Memorial# 24062949. 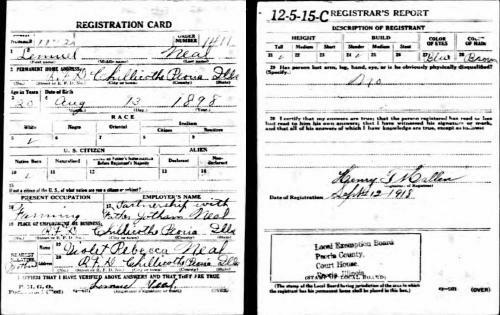 World War I Civilian Draft Registrations. [database on-line], Provo, UT: Ancestry.com, (2000) , Registration State: Illinois; Registration County: Peoria; Roll: 1614441. 1920 United States. Bureau of the Census. 14th census, 1920 population census schedules, Washington, District of Columbia: The National Archives, ([193-?]) , Census Place: McDina, Peoria, Illinois; Roll: T625_398; Page: 5A; Enumeration District: 61; Image: 1023. 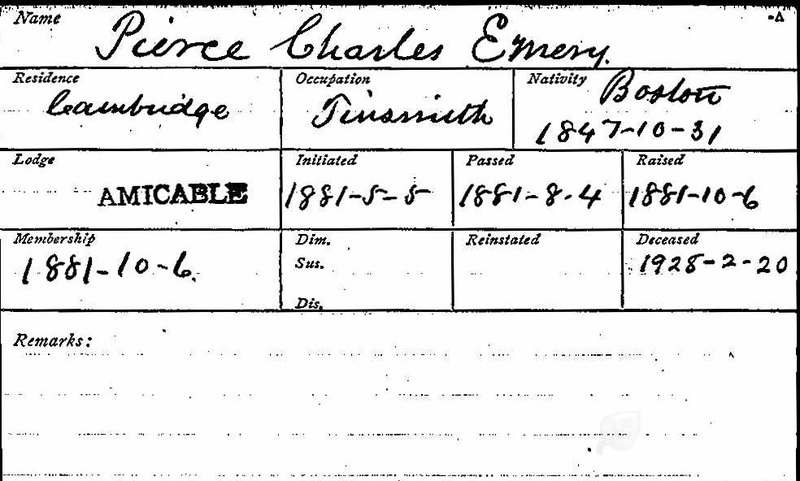 "United States Census, 1940," database with images, FamilySearch (https://familysearch.org/ark:/61903/1:1:KWCR-56K : accessed 19 December 2016), Jonathan Neal, Mossville, Medina Township, Peoria, Illinois, United States; citing enumeration district (ED) 72-22, sheet 2A, line 5, family 30, Sixteenth Census of the United States, 1940, NARA digital publication T627. Records of the Bureau of the Census, 1790 - 2007, RG 29. Washington, D.C.: National Archives and Records Administration, 2012, roll 865. Find A Grave Memorial# 24062940. 1900 United States. Census Office. 12th census, 1900 population census schedules, Washington, District of Columbia: Bureau of the Census Micro-Film Laboratory, ([197-]) , Census Place: McDina, Peoria, Illinois; Roll: 333; Page: 5B; Enumeration District: 0082; FHL microfilm: 1240333. Roxbury (Mass. ), Vital records of Roxbury, Massachusetts, to the end of the year 1849, Salem, Mass. : Essex Institute, (1925) , Vol. 1, p. 274. R. Burnham Moffat, Pierrepont Genealogies from Norman Times to 1913, , at https://books.google.com/books?id=dInRAAAAMAAJ . New York: L. Middleditch Company, (1913) , pp. 34-5, 38. Roxbury (Mass. ), , Vol. 2, p. 323. Roxbury (Mass. ), , Vol. 2, p. 615.